Taste the farm without leaving Portland’s city limits at Meriwether’s, Portland’s first – and still fabulous – true farm to table restaurant. The farm-to-table concept is no longer just a hot trend in the food world. It’s now so well-integrated into the mainstream restaurant industry that it almost seems commonplace. 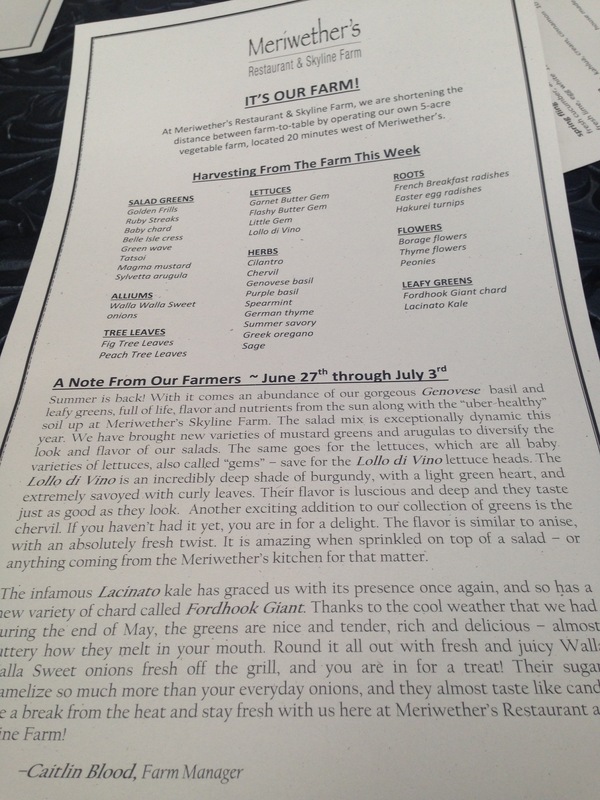 Yet Meriwether’s literally brought the farm to the table in Portland, well before the concept became fad. Produce, meat, and herbs from nearby Skyline Farms determine each week’s menu. Portland, Oregon is near and dear to my heart. I’ve spent a few posts paying homage to the quirky City of Hipsters and its food scene. Some of its staples have gone from cult following to tourist trap status, such as Voodoo Doughnut and Salt & Straw (ice creamery). The real stars of Portland’s food scene are those who dared to be different well before it was cool, and who refuse to change their execution to scale up to the masses. Meriwether’s is one of those pre-Portlandia places. Located in a mostly industrial, slow to gentrify pocket of northwest Portland, the English Tudor-style restaurant and its Ivy-covered garden patio seating area seem out of place, yet perfectly logical in that strangely hipster environment that is blue-collar Portland. Why wouldn’t a farm-to-table restaurant resembling an English country cottage be located next to warehouses, an abandoned processing plant, and a franchise of the fanciest automotive garage you’d go for an oil change maybe anywhere? In oft-cloudy Portland, Meriwether’s is part cozy refuge – with indoor fireplace and dark wood furniture – and part outdoor oasis for those gorgeous summer months. Created to showcase the bounty of Skyline Farm, located 15 miles away and just outside of the Portland city limits, its food is elegantly simple and uncomplicated. It lacks the hipster pretention of trendier urban restaurants, which makes it a great place to relax with friends. I did just that for a lovely Sunday brunch in early July. Each of our brunch dishes featured farm-fresh eggs. 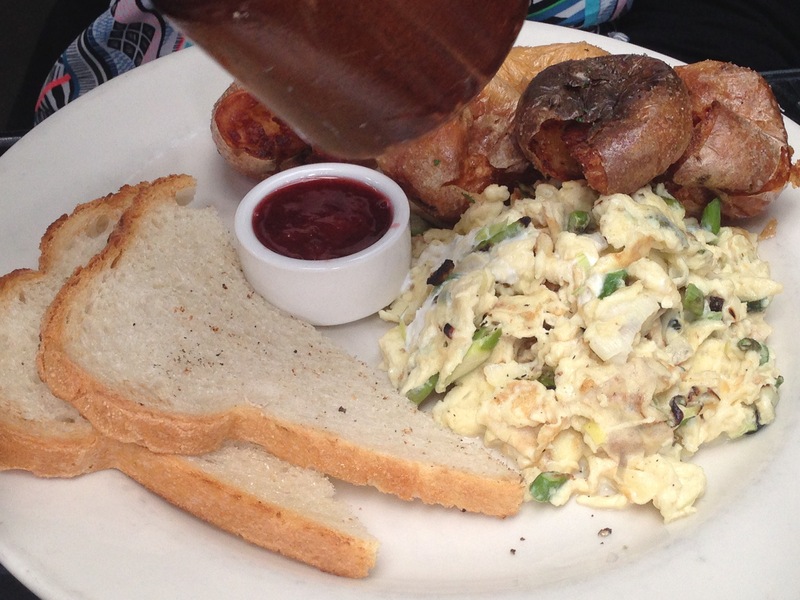 Though the restaurant is hesitant to make any accommodations or substitutions, they honored my request to turn their breakfast scramble of the week – with asparagus, leeks, goat cheese, and basil – into an omelet. 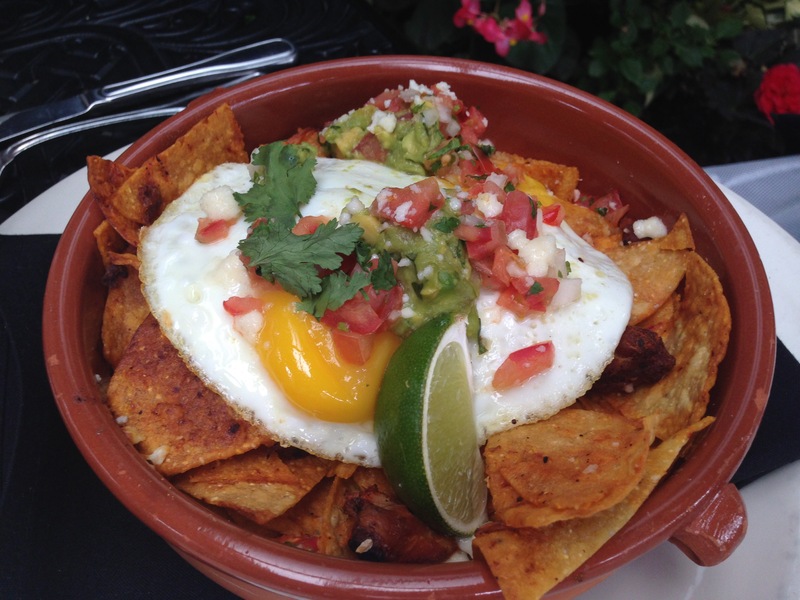 Two friends ordered the scramble themselves, while a third ordered the chilaquiles – topped with fried egg and looking amazing, as that dish I like to call “breakfast nachos” tends to do. My omelet was served with fried, skin-on potatoes. I’d call them blistered more than fried, but that isn’t reflective of how addictive they were. I rarely eat white potatoes (well, ok excepting French fries), and these were indescribably good and worth every calorie. Thick country toast from Pearl Bakery accompanied most brunch dishes. Its thick, pillowy softness really was just the perfect vehicle for the amazing homemade strawberry jam Meriwether’s did me the injustice of placing in front of me. A salad of fresh, slightly bitter garden greens made me feel a little less guilty for the potato indulgence. Brunch in the garden at Meriwether’s was a memorable Portland experience that reinforced how serious Portland takes its food and its farms. It’s a must-try Portland legend!